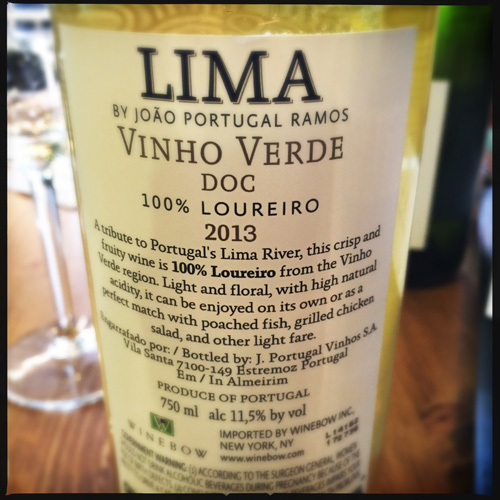 The Lima Vinho Verde 2013 is a classic example of the easy, bright wine from the Vinho Verde region in north west Portugal. Known as "green wine," Vinho Verdes are often racy wines with lemon notes and a tiny hint of sparkle on the tongue, and most often made from the alvarhino grape (albariño in Spain). This one's a little different. Made from 100% loureiro grape, it has a slightly fuller body and no sparkle, but the same great acidity that is so lovely and versatile, it gets along with almost everyone it meets. It's been inching into the high 80's here in Florence this week and the Lima - named for the Lima river that runs through Portugal - is a crisp, cool antidote. We're pouring it by the glass at The Carriage this week, so if you're in the neighborhood, come have a glass or two.